This course is about getting started with an Enterprise Architecture Practice, and in particular it’s about what should be considered when you’re looking to establish or improve your Enterprise Architecture Practice. One of the major challenges with Enterprise Architecture frameworks is ‘how to implement’ or even more importantly ‘how to start’. Some prior knowledge of architecture is expected although not required. Enterprise Architecture is a discipline that consists of many areas, approaches, guidelines and techniques and there are a number of well-known framework available for example TOGAF® (Open Group), NAF (NATO), FEAF (US Federal CIO Council) etc. This course provides a ‘how to start’ regarding getting your Enterprise Architecture Practice established (or potentially improved if you already have one). This course will provide you with an insight and enough detail to integrate directly into your practice incrementally because the module provides information and guidance on allied but distinct areas. This course covers the more important aspects of getting your Enterprise Architecture Practice established from recognizing that most candidates will have some background knowledge of Enterprise Architecture or may even be TOGAF Certified. It provides the background and exposure to some well-known subjects that are often glossed over by the other well-known Enterprise Architecture frameworks. With this is mind, we recognize the value that TOGAF brings to the discipline and we provide a brief overview to set the scene. Why Study TOGAF Implementation With 4PA ? Integration is positioned against implementation as an approach that requires consideration of your existing organization, culture, strategy, skills, structures and tools so that you can make informed choices about how to begin rather than implementing blindly from a standard. The Enterprise Architecture Practice is presented from different perspectives such as architecture demand and supply, the interactions of strategy, and architecture and delivery with some considerable focus on the operating and engagement model approaches that should be integral to the Enterprise Architecture Practice to be effective. Other areas that are immediately useful to the Enterprise Architecture are the capability assessment and looking at how the Enterprise Architecture Practice delivers to the organization by defining Enterprise Architecture capabilities and the services necessary to actually deliver. Standards and principles are considered in depth as a core part of the effective Enterprise Architecture Practice with a number of processes and approaches discussed that can be utilized immediately in your Enterprise Architecture Practice. Lastly the course addresses an important area that is often just assumed effective that of communications strategy and execution and the construction of an Enterprise Architecture charter which can be used to establish the position and authority of the Enterprise Architecture Practice. ‘Getting Started with TOGAF & Enterprise Architecture’ provides new ways of looking at getting your Enterprise Architecture Practice going. It starts by consolidating an understanding of TOGAF to set the context and progresses to introducing a usable view of the Enterprise Architecture Practice and Enterprise Architecture board. This is a practically oriented course, not a certificated course and does not include quizzes or examinations. There is no single correct answer as the exercises are practical and require you to take into account your own organization’s structure, politics, processes, objective, tools and existing frameworks. Browse the contents of this eLearning course by clicking on a module title below that you would like to know more about. Each module consists of at least one practically-based exercises for delegates to apply what they’ve just learned. Why not try a free trial module of our course before you buy! Why not try a free trial module of our TOGAF Implementation eLearning course! In this trial module, students will be taken through a quick TOGAF ‘refresher’ session covering the 6 major components of TOGAF and also a high-level view of Enterprise Architecture strategy components. 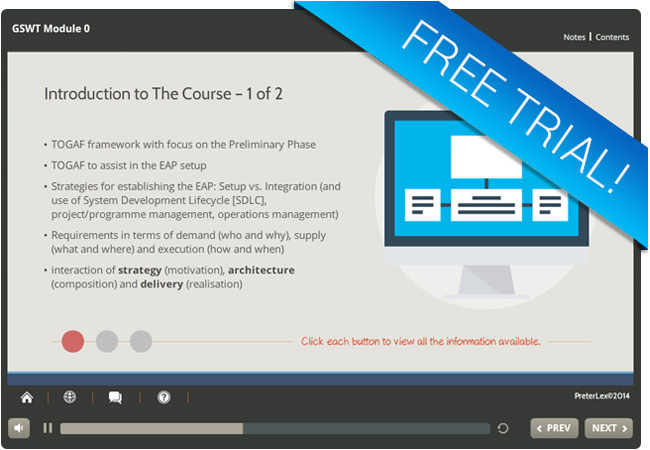 In the full course, the next module looks at the purpose of the Enterprise Architecture Practice, some of the services it should provide and then gives a full tick list of benefits that can be used for ‘selling’ the Enterprise Architecture Practice.